The Brown-headed Cowbird, Molothrus ater, is a member of the blackbird family. The adult male is easily identified by his brown head and metallic green-black body. Female cowbirds are a pale brown with a gray-brown head. Both males and females have a length of about 7½ inches. Cowbirds are called brood parasites because they lay their eggs in the nests of other birds and do not care for their own young. Their parasitic reproduction strategy is unique among the world's blackbird species. Today, brown-headed cowbirds occur throughout the United States. Cowbirds evolved to follow herds of grazing animals, often covering many miles in a day. They can little afford the time to build their own nests, lay and incubate eggs, and care for the chicks. Instead, the female cowbird finds the nest of another bird, lays a single egg in it, and leaves. The female cowbird may do this an average of up to 40 times per breeding season. In fact, a female in a captive breeding study laid over 70 eggs in a single year. The female cowbird will remove or destroy some or all of the eggs and or nestlings of the host birds. The host birds, usually songbirds, raise the cowbird chick as their own. Cowbird eggs hatch sooner and the young grow faster, so the cowbird chicks get most of the food and have been known to push the host's chicks completely out of the nest. The majority of the time the adult host birds end up feeding and caring for only the cowbird chick, rather than raising the next generation of their own kind. Throughout North America songbird numbers are declining. While there is no single reason for this decline, one major contributing factor is the spread of the cowbirds due to landscape changes throughout North America. Cowbirds once occurred only in short-grass prairies, where they followed buffalo herds, feeding on insects stirred up by the grazing animals. 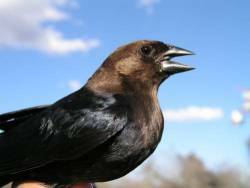 Human-caused changes to the environment, including the introductions of domesticated grazing animals and cultivated fields and lawns, has greatly benefited the cowbird, helping it to spread to new territories and prey on more songbird species. Today the cowbird parasitizes more than 225 species of North American birds. The cowbird may pose a particular danger to already-threatened species like the Black-capped Vireo. Studies have shown that the removal of one female cowbird enhances the survival of 35 songbirds per year. In an effort to manage the brown-headed cowbird populations, Texas Parks and Wildlife has implemented a Cowbird Trapping Program. Anyone interested in participating is welcome to go through our training and certification process.